Gritty, Burning, Scratchy Eyes… everybody has them… nobody wants them! The tears bathe the front of the eye. They provide a smooth optical surface for the cornea and they add lubrication to allow the lids to slide gently over the front of the eye. With each blink a new smooth surface is left on the cornea. That smooth surface bends light crisply and is critically important to sharp, clear vision. It seems like almost everything in our everyday lives conspires to disrupt the delicate balance of the tears. Anything that affects the tear film can lead to blurred vision, discomfort… or even downright pain. As we age things start to not work as well as they once did! The lids lose tension, the blink can be incomplete, and the quality and quantity of the tears can diminish, and the eyes become dry; leading to blurred vision and discomfort. Most of us drive to work we spend at least part of the day in front of a computer and we have to read, text and use the internet, all activities that require concentration. When we concentrate our blink rate slows and the eyes dry, leading to blurred vision and discomfort. Who isn’t tired these days? It seems we have to work harder and longer just to keep up! As we get fatigued our blink rate slows and our eyes dry, leading to blurred vision and discomfort. Seasonal allergies aside, air borne contaminants, air conditioning, heating can disrupt the tear film and the eyes dry, leading to blurred vision and discomfort. Soft contact lens are 50% tear film when they are on your eye. In essence they act like a sponge. When wearing contacts, that lens is in competition with the eye for the available tears. Dry eyes or even marginally dry eyes can become increasingly uncomfortable when wearing a contact lens. Dry eye symptoms include a scratchy or itching sensation when watching television, using the computer, reading or even driving. A burning or gritty sensation when you wake up is common. The feeling that there is something in your eye, a foreign sensation, is a typical dry eye complaint. Redness, blurred vision and discomfort often occur with dry eyes. All of us are dehydrated. Simply increasing your clear fluid intake will make your eyes feel better. Caffeine and alcohol contribute greatly to dry eye symptoms. 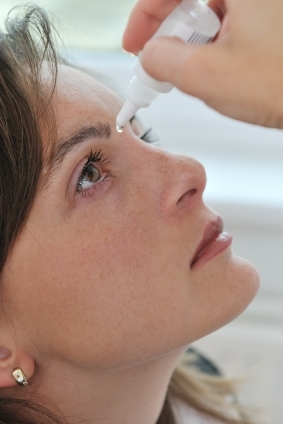 Rewetting or lubricating eye drops can relieve dry eye symptoms. Preventative rewetting, placing drops in the eye periodically throughout the day, is more effective than reactive rewetting, putting the lubricating drops in the eye in response to dryness or irritation. At your eye exam, your doctor can recommend which drop might be best for you. During sleep, tear production is greatly diminished and there is no blink to spread those tears across the front of the eye. Overnight, the tissue dehydrates and feels very uncomfortable in the morning. One of the most effective dry eye treatments is to rewet your eyes before sleep, so that they will be more hydrated in the morning. Several manufacturers make a night time gel, that lingers in your eye longer, for dry eye treatment. The tear is produced in the lacrimal gland located in the area of your temple. 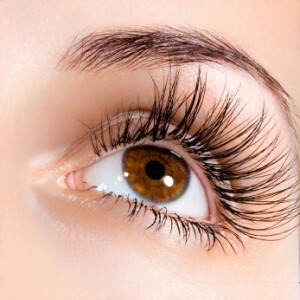 The tears then cascade across the front of your eye lubricating the lids and forming a smooth surface across the cornea. The moisture is then drained out into the sinuses through small holes in the lids called punctum. By blocking these holes we can back the moisture up into the eye relieving dry eye symptoms. Initially the doctor will insert collagen plugs that will slowly dissolve over seven to ten days. If you experience an improvement, a more permanent silicone plugs can be used. These plus can always be removed and deliver tremendous relief to many people. The Opticians at Parrelli Optical® are experts in fitting contact lenses for dry eyes and our Independent Doctors of Optometry specialize in the diagnosis and treatment of dry eyes.